I recently treated myself to a copy of Lindy Smith's lovely book Cakes to Inspire and Desire, and I was definately inspired! The above is the latest result of that inspiration. 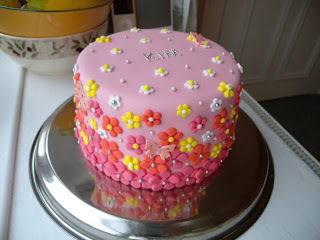 It's a three layered lemon madeira cake with lemon buttericing, covered in home made Marshmallow Fondant and decorated with Marshmallow Fondant flowers and butterflies, edible silver and pearlised balls, and edible pink glitter - very girly! This is my first time using Marshmallow Fondant, I'd read good things about it online, and despite being very sticky and messy to make it was definately worth the effort - the flavour is so much nicer than ordinary fondant.